We’ve been silent for awhile. Sorry about that…but truthfully, there has been little to report. We have accomplished a few projects in the farm house, garage and garden areas – yet our to-do list remains full. We often find ourselves at odds with time and Mother Nature. But we have performed a little re-hab of the house, building of a cool room in the garage, and mulching of a quarter of the garden (small victories). All of my beautiful, delicious and hardy greens that we were enjoying (to this point) all have melted….how can you blame them? Last Tuesday’s low was -4 degrees F (wind chill was something like -13 deg F…we shut up the farm house and stayed in town)! Even with two row covers as protection…the wet from earlier rain chased by the seriously sub-zero temps with high winds were too much for these plants to withstand. They froze solid then liquified when they thawed. Not much we could do about it as we didn’t have a plastic cover over them. 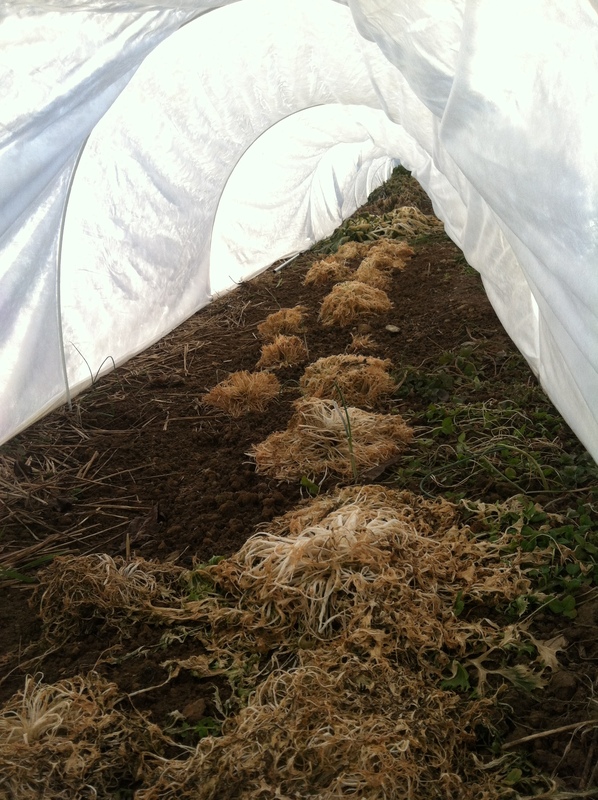 It is just proof that we need to try our best to erect some high/low tunnels to help protect our plants. So, stay tuned….construction may be imminent! For now, records are being reviewed, crop/seed lists are being made, crop plan are being mentally mapped, and seed catalogs are being read from cover to cover…Despite the cold, January is still a fun and exciting month full of anticipate of what is coming! Hope you are keeping snug and enjoying this time of year, too.